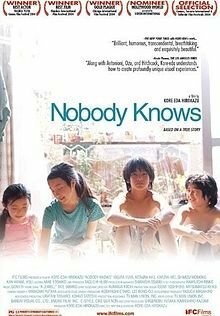 A young single mother, Keiko, moves into a new apartment with her four children, Akira, Kyoko, Shigeru and Yuki, transporting the younger children in suitcases and letting Kyoko take the train so they won’t be discovered (as they were evicted from their last apartment for being noisy). The children are all of different fathers and Keiko is looking for a new boyfriend who will pay for them all. One day Keiko abandons the children with an envelope of Akira, only 12 years old, to take care of the others indefinitely. The film shows the children’s life after their mother leaves and what happens to them. The film is very well directed and the four young actors, who carry the weight of the film, are exceptional. You really feel for them as their situation goes from bad to unbearable. The main criticism of the film would be that the pacing is very slow, perhaps intentionally to build a feeling of helplessness and grinding tedium the kids are experiencing cooped up in the apartment, but lacking any real goal or direction means the audience is required to have a great deal of patience to see the film through to the end. The other problem with the film is that it doesn’t show the full horror of their predicament. This film is based on a famous 1988 case of abandoned children, the details of which are more harrowing and disturbing than they are portrayed in the film. The music, which seems at times to be almost whimsical and light hearted, along with a few scenes of the children playing and having fun, almost undermine the horrific premise of the film. Hopefully this film succeeds in raising awareness of this case so similar can be prevented in the future. As a narrative I found there were a few too many lulls to keep it engaging throughout, although the direction and acting were great. The issues it raises about child neglect, abandonment, the problem of the loss of the nuclear family, the plight of single mothers and perhaps the failure of government to fund prevention of these cases are all important. And while it is a noble effort I felt that the film would have benefited from a more shocking, realistic telling of the tale to really affect people.